It has been well established that the limiting efficiency of single crystals falls at about 29% [Swanson] this limit was established in the seminal work by Tiedje. In figure 1 we can see this limiting efficiency as a function of solar cell thickness. In this diagram, the peak efficiency is shown to be 29% with a thickness of just under 100µm. Typical production solar cells achieve about 20% efficiency, while the best laboratory efforts have achieved about 25% [Swanson]. Green provides an excellent summary of the current progress of high-efficiency single-crystal silicon solar cells, and reconfirms the 29% limit established by Tiedje. The process of manufacturing solar cells from single crystal p-type silicon wafers is detailed below. This is the generalized method used based on a number of sources. It should be noted that different companies have different patented, and trade secret processes for each of these steps, but the steps remain the same. After an initial cleaning procedure, the wafer is textured to create pyramid-like structures on the surface of the silicon. This causes incoming sunlight reflected off of one pyramid to bounce into other pyramids on the surface improving the overall sunlight absorption rate. A variety of methods are used to dope the top surface of the P-type wafer to create N-type regions. This process (typically gas diffusion in a high-heat furnace) creates the critical p-n junction which forms the permanent electrical field. The doping process causes the phosphorous dopant to diffuse to the edges of the wafer, if this excess dopant was allowed to remain it would cause short circuiting between the positive and negative contacts of the solar cell. The excess dopant is removed by an acid-etching procedure. The wafer is then given an anti-reflective coating, usually silicon nitride, to improve absorption. 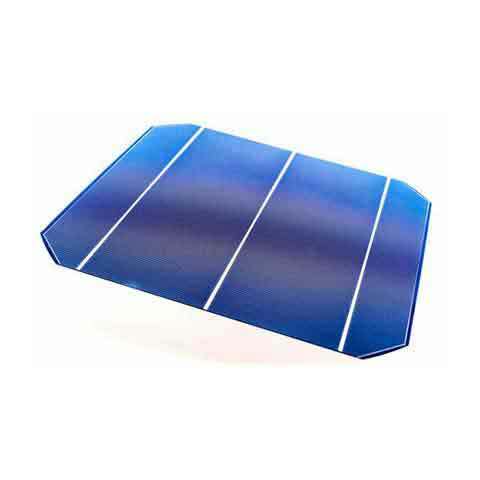 In the final step of the production process, front and rear surface contacts are screen printed onto the surface of the wafer to create the positive and negative contacts of the solar cell. The solar cells are then ready to be wired together to create solar panels.